I needed a new shooting board (or chute board, depending upon where you live) as my old pine one had seen better days. I have historically built my shooting boards very simply and quickly. I use whatever wood (or plywood) I have on hand, and then glue and screw everything together so it won’t move. I even glue and screw the fence in place in a cross grain fashion. I have done this regardless of whether I’ve built the shooting board out of plywood or solid wood, and I’ve never had a problem. Planing the cherry for the main board and chute. I’m planing across the grain, also known as traversing. 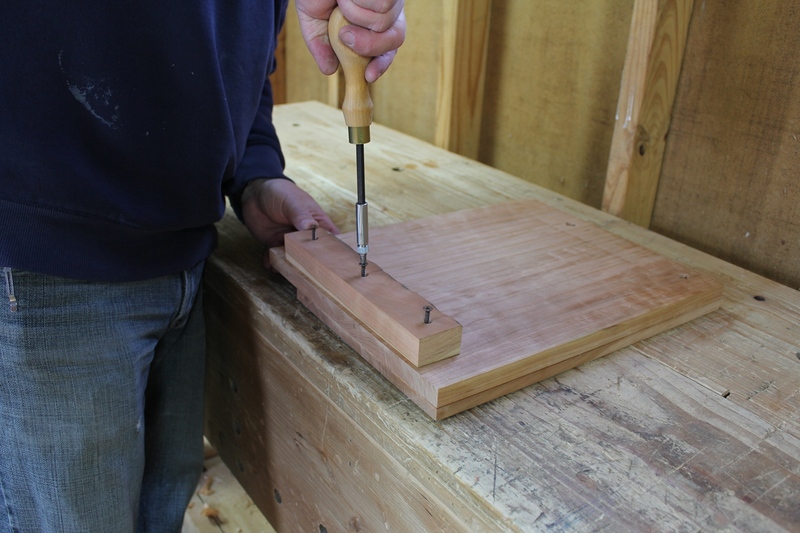 This makes planing easier, faster, and helps to remove any cup across the width of the board. However, even though I’ve been successful with my quick and dirty shooting boards over the years, I decided this time around to take a little more care in making it. You see, until we moved to our new farm about 2 years ago, my shop had always been inside the house, either in the basement, or, for the 10 years prior to moving to VA, in a spare room inside the main part of the house. This meant that the space was always a fairly consistent temperature and humidity due to the indoor climate control. So wood movement in my old shop wasn’t a big issue. 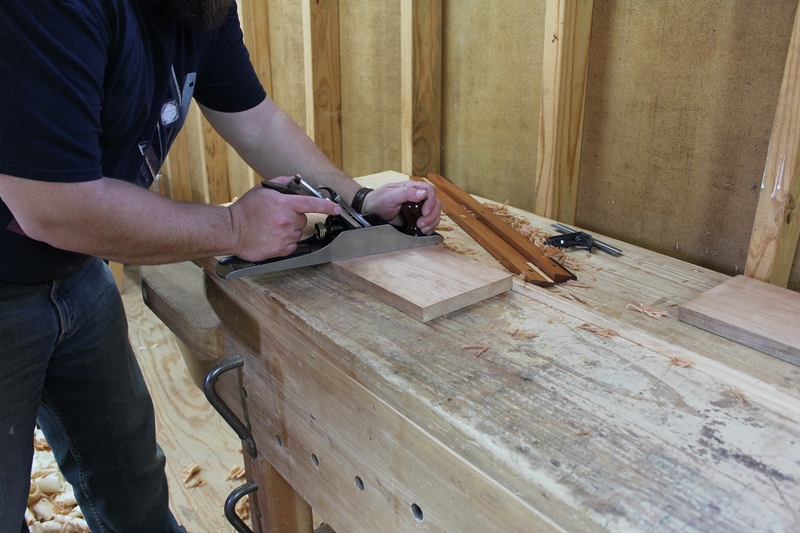 However, when we moved to the mountains and my shop became the uninsulated shed in our back yard, wood movement became a much bigger issue for me to deal with. That’s one of the reasons I sold a lot of my wooden planes last year and went back to using a lot more metal again. But I digress. So in order to allow for some movement in the new shooting board, and hopefully ensure that things stay flat and square, I decided to build my new shooting board a little more fancy than my previous versions. I still used whatever wood I had on hand to build it (cherry in this case, because I had some pieces that were a good size), but I treated the construction process more like I would if I were building a piece of furniture rather than as if I were building a throw away appliance. 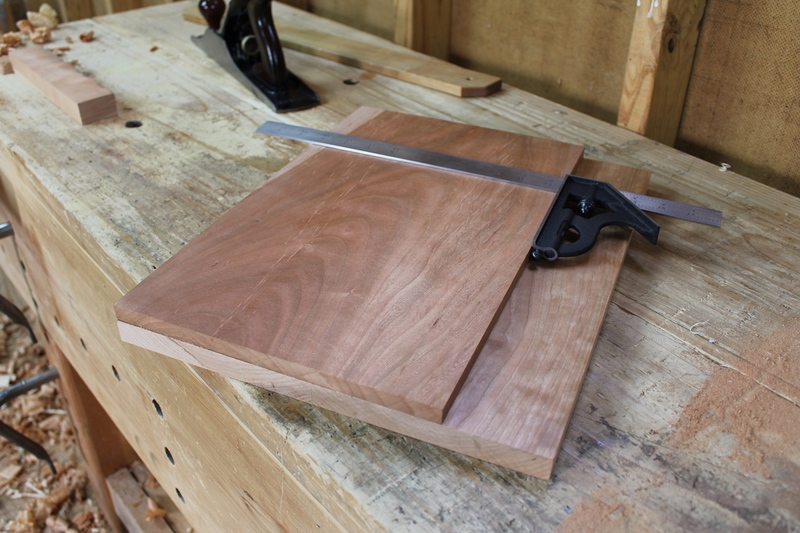 The main part of the board and chute are solid cherry, face glued to oppose cupping. So my first step was to carefully prepare the parts. 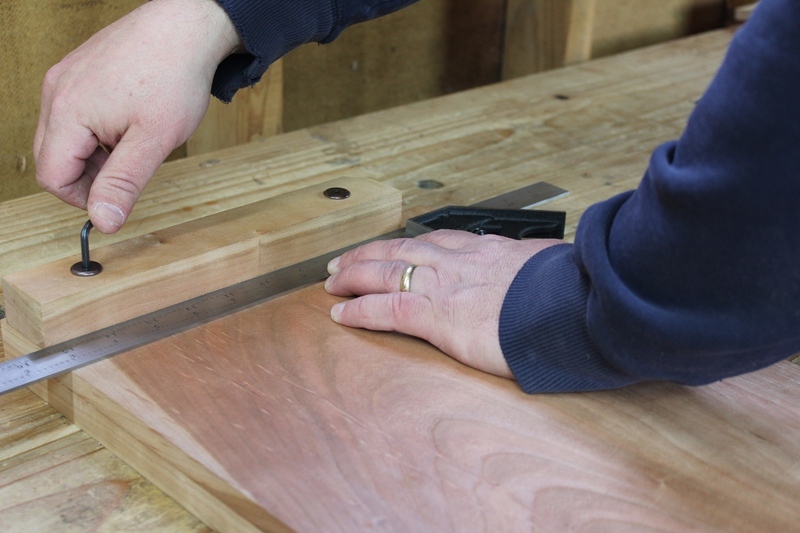 The main board consists of two pieces of cherry, edge glued at the center, to make a panel that is about 12 1/2″ wide and about 16″ or so long (the dimensions are not that important). 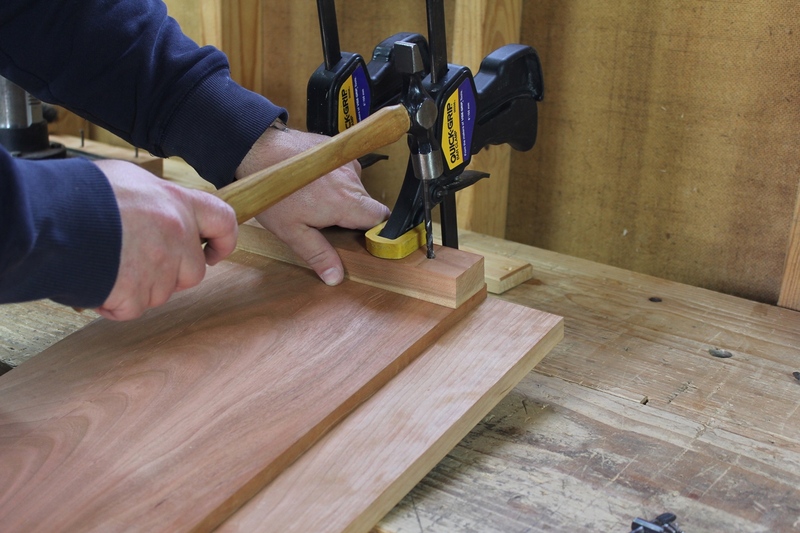 On top of the 3/4″ thick bottom panel, I face glued another piece of cherry that is 1/2″ thick and about 9 1/2″ wide. These boards were planed very flat before gluing and were glued and clamped with their annual rings facing each other in the hopes that the assembly will stay a bit flatter since any tendency for an individual board to cup will be opposed by the board glued to its face. The hardware for the cleat and the adjustable fence. With the main board done, I had to address the cleat that attaches to the bottom to catch the edge of the workbench, and the adjustable fence. The cleat is straight forward and really doesn’t require a lot of explanation. Essentially, it’s nothing more than a piece of cherry, planed straight and square, and attached to the bottom of the board with glue at the center and three screws. The adjustable fence was prepared from a similar piece of cherry, which I planed flat and square on all four sides, and squared up one end. However, the fasteners for the adjustable fence would need to be installed in a way that would hold the fence rigid and square against the force of planing, but still allow easy adjustment when needed. I considered wing nuts, knurled brass nuts and those plastic knobs. However, I didn’t want something that would stick up above the fence and get in the way of holding the stock being planed. So I decided that wide, flat headed furniture bolts would do the trick. While they need to be tightened with a hex key, their flat profile makes it as if they’re not even there in use, with no need to counter bore them. To ensure the holes for the cleat and fence were bored perfectly square to the fence, I broke out my old, rusty, bench top drill press. The first step in attaching the fence was to ensure that the holes in the fence and board were bored very accurately. So I turned to my old bench top drill press. I don’t use this drill press very often in my woodworking. I mostly use it with small, soft wire wheels for cleaning up old tools and for tool making when I need to drill metal. But for times like these when I need a really plumb hole, I’m glad that I have it. With the holes bored in the fence, I clamped everything nice and square and used the drill bit to transfer the location of the hole to the board below before boring the corresponding holes in the board. I’m using 1/4″-20 furniture bolts for the fence attachment. The hole in the fence for the bolt closest to the chute was bored at 7/32″. This was the diameter of the bolt shaft above the threads. While this meant that the bolt would have to be threaded through the fence with the help of a hex key, it ensured that there was zero play in the hole in the fence for that particular bolt. I felt this was important because that bolt would be absorbing the force of planing. 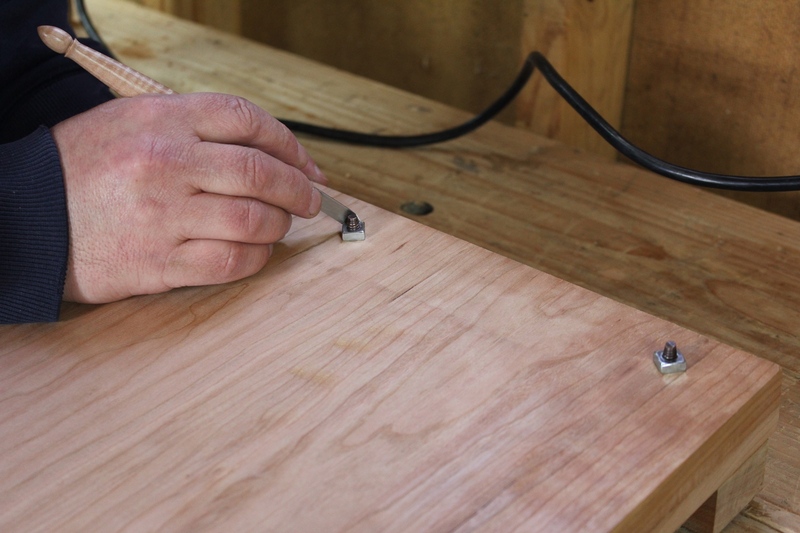 The corresponding hole in the board was drilled at 1/4″ so that the threads were tight but the bolt could still be pressed through the board and wouldn’t thread into the board itself. The holes in the fence and board furthest from the chute were both bored at 5/16″. This would allow for the fence to pivot around the bolt closest to the chute, permitting the fence to be re-squared. All holes were countersunk with a snail bit in a brace. After boring all of the holes, I used a snail bit in a brace to countersink all of them, on both sides. 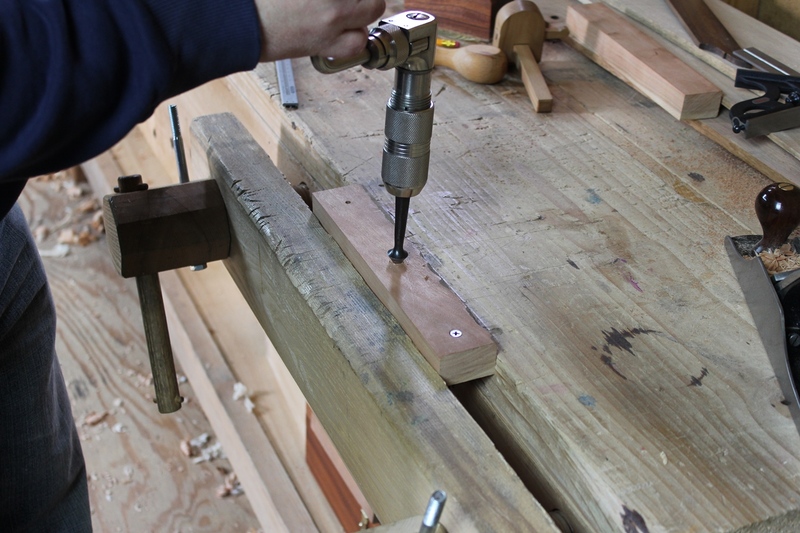 I wanted the screws for the cleat to sit countersunk, and countersinking the bottom side of the hole ensured there were no small chips that would prevent the cleat from sitting flush with the board. The fence holes were also countersunk top and bottom. 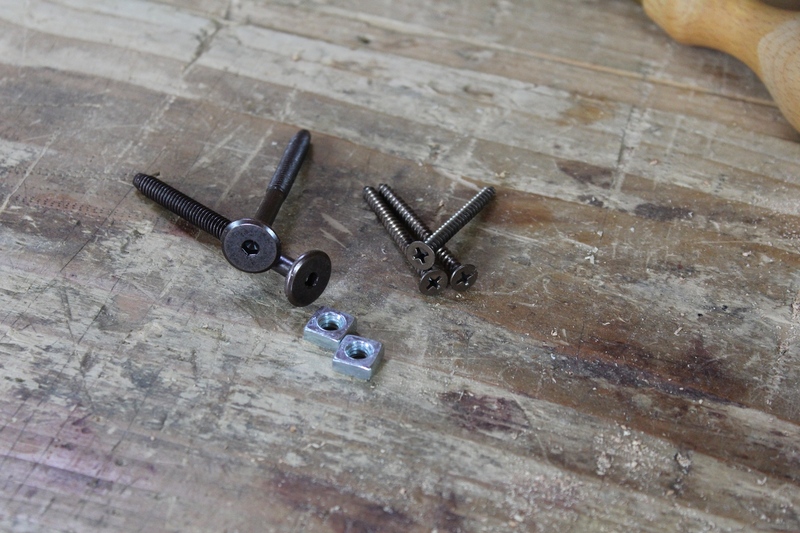 The furniture bolts have a small flair under the head, so the countersink ensures that the bolt head sits flat and fully supported on the surface of the fence. Transferring the location of the square nuts to the bottom of the board. With all the holes bored and countersunk, I temporarily attached the fence with the furniture bolts and square nuts, making sure that the fence was square to the chute while doing so. I then turned the board over and scribed the location of the square nuts onto the bottom of the board. The fence was then removed and the square nuts were mortised into the bottom of the board so that they would sit slightly recessed when the whole thing was reassembled. I considered affixing the nuts into the board with a bit of epoxy, but I decided not to at this point. I can always do so later if I decide that it’s necessary, but I doubt it will be. The cleat was attached using glue at the center 2″, and three countersunk screws. After mortising for the square nuts, I could complete the final assembly. The cleat on the bottom was attached with glue and screws. I just glued the center 2″, again, to allow for wood movement and hopefully keep things flatter over time. The screw on the chute side had to be ground down shorter to ensure that it didn’t come through the chute. I tightened the bolt on the right side first, then squared up the fence and tightened the bolt on the left. Time will tell how well things remain tight and square. Before attaching the fence for the final time, I cut a 45 degree bevel on its back corner to prevent spelching (chipping on the back side) of the fence in use. I cut the bolts to length, and tightened the bolt on the chute side first. Then I set the fence square to the chute and tightened the bolt on the left side. The only thing left to do was to run in the chute and fence. So I put my 605 in the chute and planed the end of the fence until it was flush with the chute. A little wax on the chute and everything works well. I put a little wax on the chute and the plane glided just fine. Only time will tell if the fence holds its setting well. If it does end up shifting in use, I may try to adhere some thin 600 grit sandpaper to the bottom of the fence, between the fence and board, to see if that holds the setting better. But for now, I’m going to leave it be and use it as is. Hopefully I’ll treat this one better than I have others in the past. I guess that means I shouldn’t chop dovetails in its surface like I’ve done with my other ones. Posted in Appliances, Tools and tagged chute board, shooting board. Nice shooting board! I currently shoot without a chute, just a barebones hook. Upgrading is tempting. When I moved to NOVA, I had to do major work on my wood bodied planes for the some of irons to even bed. Filing down width of the irons was the most straightforward way to do this for me. I end up favoring an older, looser-fit preston jack most of the time. I’ve never been able to get my strike-block plane fitted well enough to keep a constant projection while shooting, but maybe that has more to do with the wedge. Even storing tools inside my apartment, I still have issues with summer AC condensation leaving rust spots on oiled saws. Anyways, great post! 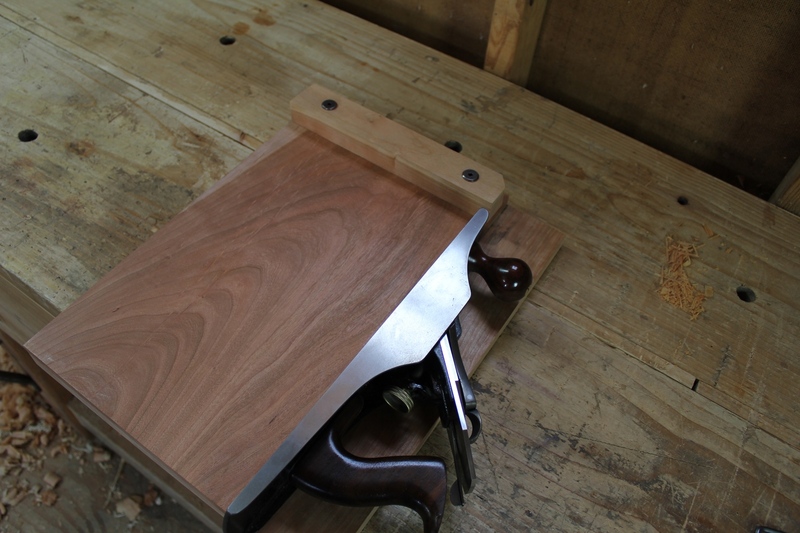 I used to shoot with just a bench hook. But my bench just isn’t flat enough for consistent results. The full featured shooting board has always done a better job for me. I’ve noticed that you are using square nuts for the fence rather than hex nuts. Good to maximize projected area against planing forces applied to the fence, I suppose. I also noted that you oriented the nuts diagonally rather than square to the grain. Wonder if that may be more likely to split the base, acting as a wedge. Square orientation would have no such effect. But then again, a shooting board isn’t likely to have a 200 year service life anyway, so Whiskey Tango Foxtrot. Yeah, I like the square nuts because the square mortise for the nut is easier to make. I also like them for more surface area, but not because of the planing force. The planing force is taken up by the shaft of the through bolt itself. There should be very little tendency for the nut to want to move forward and split the base. Where the nut will apply a lot of force on the wood is when the bolt is being tightened. There’s a lot of torque there. But by aligning the nut diagonally, the torque force applied to the wood by the nut when tightening is always against end grain. 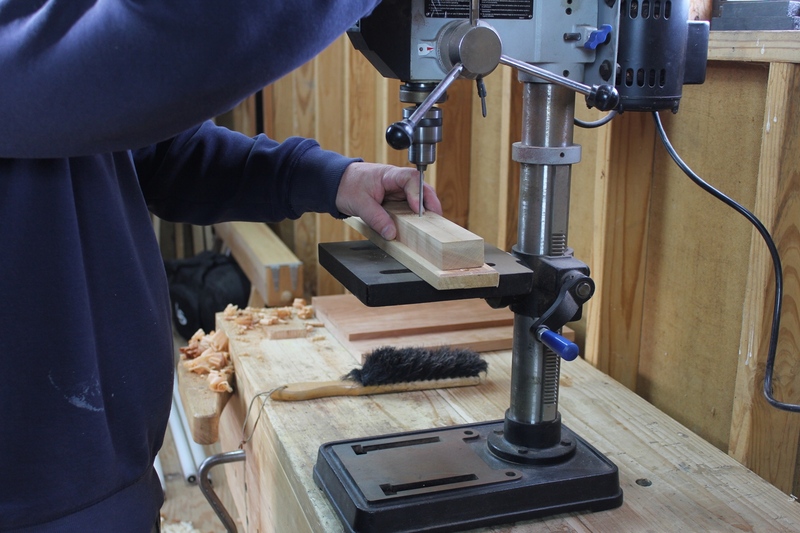 This should help prevent the nut from damaging the wood inside the mortise as the end grain is less likely to compress and wallow out compared to the face grain that would be exposed if the mortise were parallel to the grain. Probably a non-issue either way, but that’s the way my brain was working.